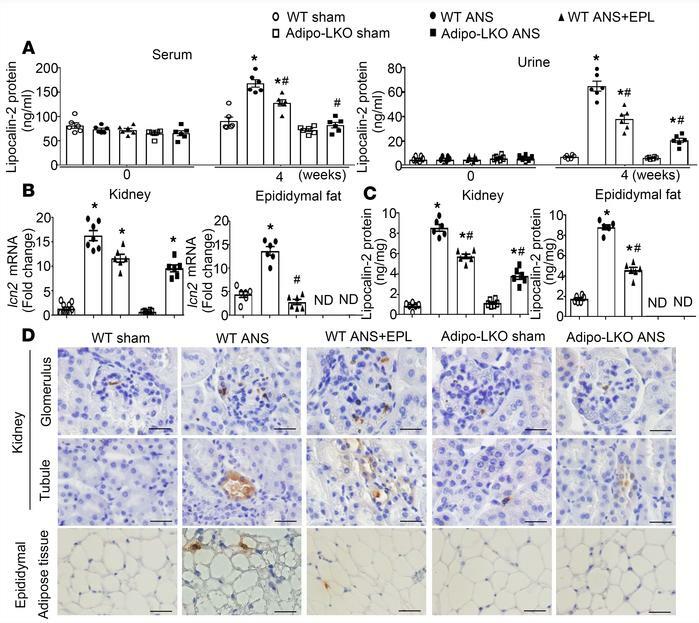 WT mice treated with ANS (uninephrectomy, aldosterone 200 μg/kg/day, salt 1%) exhibited increased lipocalin-2 expressions in kidney and adipose tissues. (A) WT and Adipo-LKO mice (12 weeks old) were subjected to sham or 4-week ANS treatment. Eplerenone (EPL) was given to the WT mice 1 week after starting the ANS treatment and continued for another 3 weeks. Serum and urine samples were collected before and after the treatment for measuring lipocalin-2 levels by ELISA. (B and C) The mRNA expression of lcn2 and the protein content of lipocalin-2 were examined in kidney and epididymal adipose tissue by qPCR (B) and ELISA (C). (D) The localization of lipocalin-2 protein in kidney and adipose tissue sections was examined by IHC using an antibody specifically recognizing murine lipocalin-2. Magnification, 400×. Scale bars: 20 μm. Data are presented as mean ± SEM; *P < 0.05 vs. WT sham controls; #P < 0.05 vs. WT ANS by ANOVA with the Bonferroni post hoc test (n = 6–8).